At one of our customers we are running a project where we are integrating various systems, among which a hosted CRM 2011 on premise. 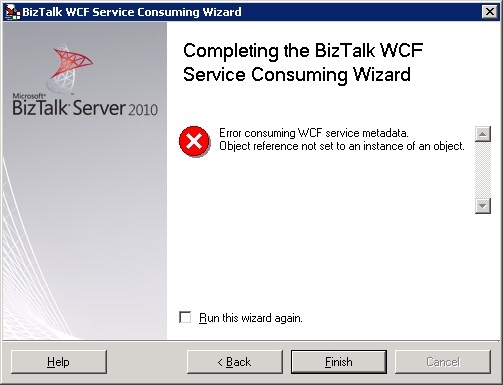 In older versions of CRM we had a BizTalk adapter which could be used to set up communication between BizTalk and CRM, however with this version this is no longer the case. Microsoft has decided integration should be done by using the new webservices CRM exposes, which sounds easier then it turned out to be. This would indeed import the WCF service, however this was not the end of the problems. 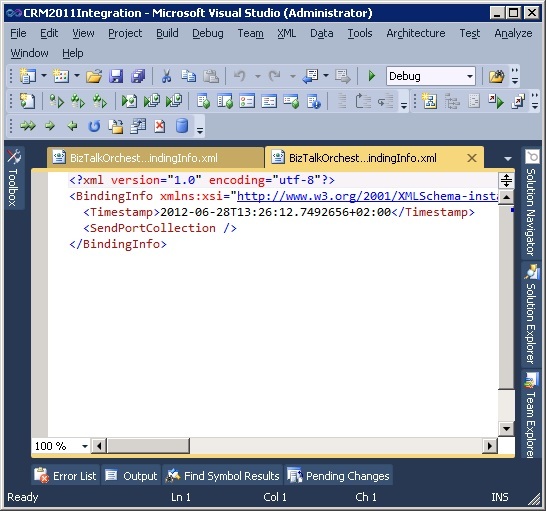 Microsoft allready knows about this, and has released new schema’s with the CRM SDK. So I downloaded the SDK, got the schema’s and replaced the incorrect schema’s in my project with these new ones. Ok, so when I try to build now, all is okay. On to the next problem. When I opened the bindings file, to my surprise it was nearly empty. No ports were defined, so I would have to create these myself. I don’t know yet where all these problems are coming from. It might be a problem with the settings our hoster uses, seeing how all resources I found said it should work like this. I will go and find out what causes this at a later time, but for our customer I had to move on. 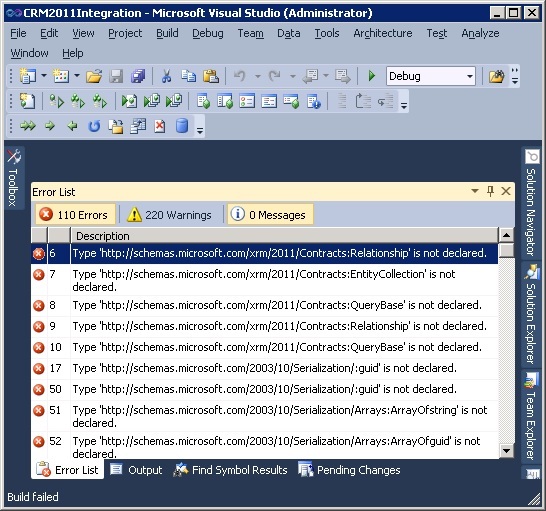 At this point I also found out that the untyped method would work fine as long as we stay on the on premise version of CRM, however it will not work if you want to go to the online version. Also the way the untyped option works, is through mappings with a lot of custom XSLT, which does not seem perfect either. Because of all of this, I decided to look in to the typed version. More on this in my next blog post. If you want to try the untyped option of integrating yourself, Richard Seroter has made a very nice blog post on this.